In a move that should be music to the ears of Coachella and Stagecoach festival attendees next year, the California State Transportation Agency awarded $5.9 million to the Riverside County Transportation Commission (RCTC) to construct a temporary train station platform in Indio, paving the way for special event trains as early as next year. RCTC competed for the grant through the State Rail Assistance program funded by the gas tax and is contributing an additional $2.7 million to build the $8.6 million project. The funding will build a temporary train platform at the City of Indio Transit Center, along with improved pedestrian access to Amtrak rail service that operates on adjacent to the tracks. RCTC and the Los Angeles-San Diego-San Luis Obispo Rail Corridor Agency (LOSSAN) have requested access to run special Amtrak trains to the music festivals. 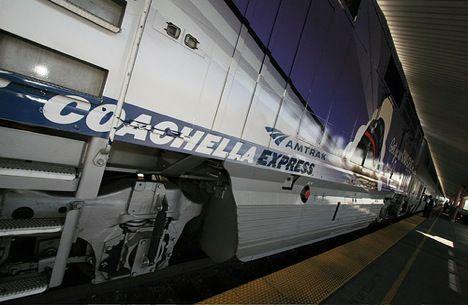 Concert-goers would board the Amtrak train at Los Angeles Union Station to travel to the Indio Transit Center, then ride a connecting shuttle to the festival grounds. LOSSAN Vice Chair and RCTC Immediate Past Chair Dana Reed credited the late Cathedral City Councilmember Greg Pettis for bringing the service to the area. access. Construction could begin late this year. development of a long-term San Gorgonio-Coachella Valley Rail Corridor Service. information about this project and to register for updates, visit rctc.org/cvrail. improve mobility. Visit RebootMyCommute.org to learn more.